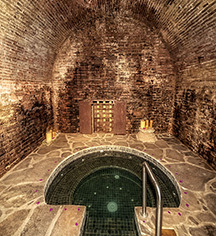 The goal of the Spa at Hacienda el Carmen Hotel & Spa is to provide a harmonious, peaceful environment, and excellent, individualized services for every guest, in a setting specifically devoted to purifying the body, balancing the mind, and elevating the soul. Guests who indulge in a massage will experience a peace that renews energy, promotes relaxation, and encounters nature in an alternative space and time. All services include a hydrotherapy cycle (30 minutes). The specialists at the Spa have selected a variety of the best massages, ones with the greatest impact on health, improving circulation, relaxing muscles, and aiding digestion. 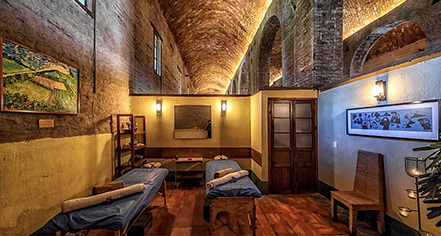 The massages stimulate the lymphatic system and encourage the elimination of toxic substances from the body. This massage is dedicated to eliminating tension and muscular pain from the neck, shoulders, and back. It is an intensive relaxation massage with special techniques applied to make the body, muscles, and bone system relaxed and rested, helping to achieve healing sleep. This massage uses a variety of techniques, such as acupressure, reflexology, and stretching, to help balance and relax the muscular and nervous system. The correct pressure for this technique is from soft to mid-intense, achieving the elimination of physical and mental stress, the improvement of blood circulation and mobility of joints, and the elimination of muscular tension. Aromatherapy is the art of recovering health, beauty, and well-being through the use of essential oils from plants, roots, seeds, petals, and exotic woods. These oils are absorbed quickly through the skin or by inhalation, acting on diverse body systems. This massage is sedating and balancing, with emphasis on the lymphatic and vascular circulation. It is offered in two options: 60 minutes for toning and revitalizing or 80 minutes for calming and relaxing. Marble stones previously heated with steam and anointed with fine natural oils, smoothly sliding over every muscle of the body, bringing a deep physical and mental relaxation to stressed zones. It also includes energy balancing and stimulates peaceful sleep. Purification ritual from the Aztec Indians applied to detoxify the body while initiating a series of naturist medicine healing treatments. Reservation required, 8 people minimum.